The MCN Honda Off-Road Experience is run in association with CAS Honda, who also run Honda's official world and British championship motocross teams, so you know you'll be guaranteed expert advice and quality machinery. The day is geared specifically to the road rider with little or no experience off-road, so it's the perfect way to have fun and improve your riding skills. There is no minimum qualification to take part, you just need to know how to ride a bike. Off-road riding teaches you about balance and machine control. Before long you'll be used to your bike getting out of shape on loose surfaces and how to react. The bikes are all Honda single-cylinder four-strokes with user-friendly torque to suit all levels of experience. 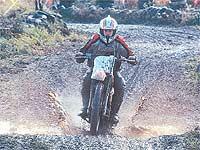 Beginners to off-roading can start on XR100Rs or XR250Rs but there are also more powerful XR400Rs if you feel ready. North: Sept 17, 18. Oct 23, 24, 25, 29, 30, 31. Nov 12, 13, 14. Dec 4, 5, 6. Midlands: Sept 4, 5, 6, 11, 12th. Oct 8, 9, 15, 16. Nov 20, 21, 22. South: Sept 26, 27. Oct 2, 3, 4. Nov 5, 6, 7, 27, 28, 29. Dec 10, 11, 12, 18, 19, 20. £120 for a day's riding. Courses start at around 10am, finish at around 4pm and are usually limited to groups of 12 to ensure individuals get all the attention and tuition they require (though the main accent is on riding, having fun and improving your bike skills).